Carry and protect your camera—and leave the bulky camera bag at home—with miggo. 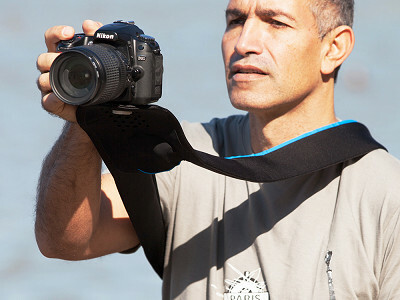 An exciting new idea in camera carriers, miggo is both a camera strap and a padded camera case. 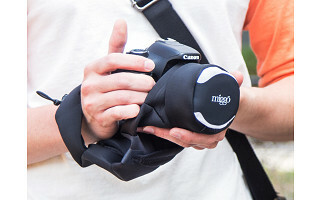 Keep your camera around your wrist or neck while shooting, and simply wrap it up in your miggo when you’re done. The durable neoprene and lycra fabric provides cushioning to keep your camera protected. This camera strap and cover makes a great gift for the amateur photographer or traveler in your life. miggo fits small to mid-sized DSLRs and comes in two different styles. 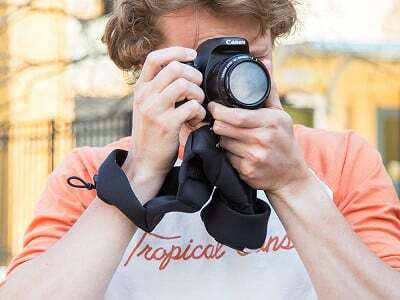 The Strap & Wrap is worn around your neck or across your body, while the Grip & Wrap has a convenient handle to keep your camera comfortably in your hand. You don’t need to take it off when attaching a tripod, and there’s even a hidden pocket for your lens cap. miggo Founders Yuval Kemp, Ohad Cohen, and Guy Sprukt worked in the camera industry for years, and knew there had to be an easier way to protect and carry your camera simultaneously. After months of research and development, miggo was born—your camera’s best amigo. Hello everyone! I'm happy to present miggo to The Grommet. I'd be happy to answer any questions you have about our soft camera case/strap hybrid! Hello Ohad! Great concept. I love the idea of a strap that protects my camera so I can put my camera down in my personal bag and not have to carry a camera bag as well! I just wanted to verify if it would work with a Canon 60D? The description says "small to mid-sized" and I'm not sure if our idea of "mid-sized" would be the same. 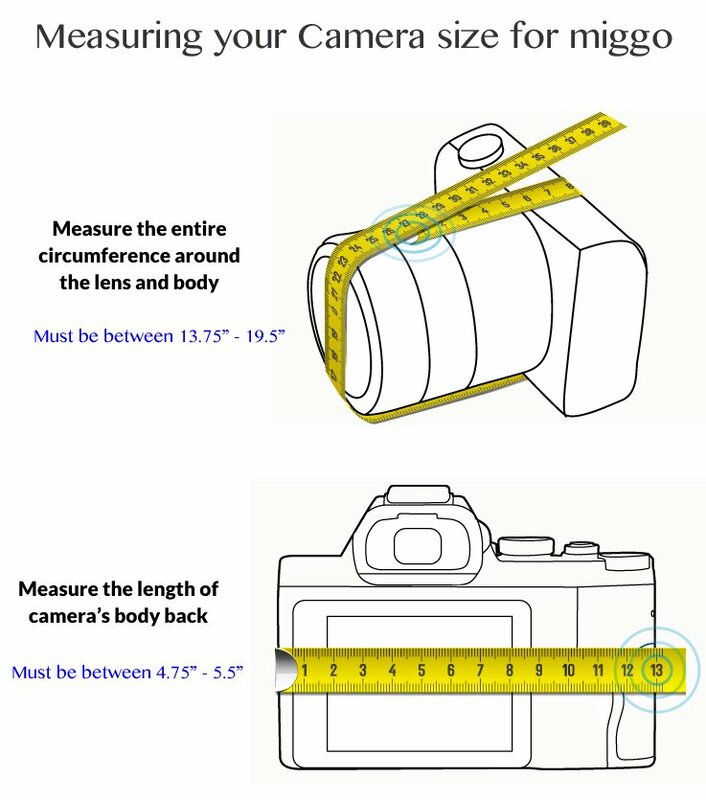 Hi Libby this Camera Measuring Guide should help! Would this work with something a little smaller like the sony a5500? Hi Pat, check out the Camera Measuring Guide to know for sure! This product looks amazing. I have been searching for something exactly like it, something small, portable, and frees me of having to carry heavier bags. One question, is the strap adjustable? @Tanya Hi Tanya, its not. Here is a nice chart on here showing the way the strap "sits" on shorter to taller persons. Ohad. @tanya To be honest, Tanya, the "extra" room (if it's a little too big for you) is great for fluid movement. You can just grab your camera, shoot, and not have to worry about adjusting your strap to get the camera angle you want. At least that's what we found while testing. I personally thought it was too long until I realized how much easier it was to use. This looks like a great gift for Father's Day. What is the shipping time on your orders? Hi Michael, it will depend on your location, but it should come in plenty of time for Father's Day if you purchase soon! RATS! I've been pining for something exactly like this for 30 years! Unfortunately, it's too small for my Nikon D810 and too large for my Nikon One. Any plans for larger and smaller versions? Hey @Terry! regarding your Nikon One: We are planning on releasing this product later this summer and we'll see if there is any interest in The Grommet selling it. Stay tuned! @Ohad Awesome! Now, if you'll do my D810 also, life will be perfect! It's a big, full-size Nikon and usually sports a pretty long lens. Would have to be larger rather than smaller. HI - I have a Nikon d7100. I just measured per your camera measuring guide and my camera is 20"circumference. Is that half-inch a deal breaker? Width wise it's fine. @Maro Hey Mario, If you are looking to get the Strap&Wrap then there is no problem at all. the Grip will be too small. @Ohad OK, my d810 is a half inch under in width as well, but runs 23" around with my standard lens. Maybe it will work counterclockwise? Hello Ohad! I love the idea of safley wrapping up my camera. I have also been looking at the Capture pro camera clip. Are they compatable? I am going to Hawaii and definitely want to take my good camera, but it does get heavy and cumbersome. Will the camera swing on your strap if I bend to look at something? I was planning on clipping the camera to my backpack or shorts. Thoughts? Hi Cindie, it might create the swinging motion with the Strap and Wrap miggo, but if you have the strap set so the camera is resting against your back, it won't be an issue. With the Grip and Wrap, you can hold it tight in your hand and not have any swing at all. I'll let Ohad speak to the compatibility of the camera clip. Stay tuned! Thanks for asking! Both Strap&Wrap and Grip&Wrap aren't compatible with the Capture system. The Capture is a great solution but leaves your camera exposed when done shooting. I think you should decide what are your needs and how do you like to walk around with your gear. Enjoy Hawaii! Carry and protect your camera—and leave the bulky camera bag at home—with miggo. 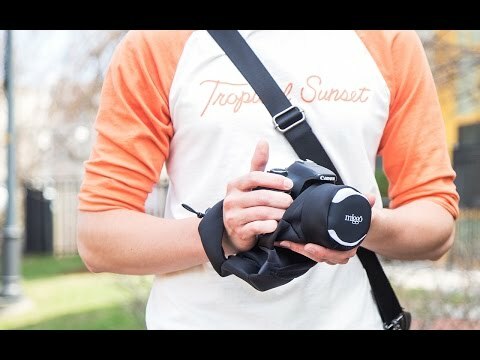 An exciting new idea in camera carriers, miggo is both a camera strap and a padded camera case. 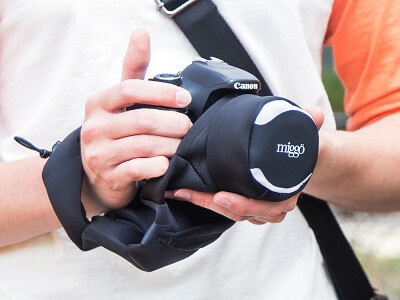 Keep your camera around your wrist or neck while shooting, and simply wrap it up in your miggo when you’re done. The durable neoprene and lycra fabric provides cushioning to keep your camera protected. This camera strap and cover makes a great gift for the amateur photographer or traveler in your life. miggo fits small to mid-sized DSLRs and comes in two different styles. 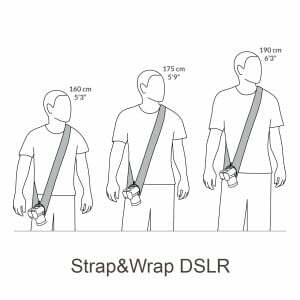 The Strap & Wrap is worn around your neck or across your body, while the Grip & Wrap has a convenient handle to keep your camera comfortably in your hand. You don’t need to take it off when attaching a tripod, and there’s even a hidden pocket for your lens cap.